You can upgrade from one GroupMail Edition to another at any time and just pay the difference in price. Top 5 reasons people upgrade from the Personal to the Business Edition. 1. You get 253 more delivery connections with the Business Edition. It’s like GroupMail on steroids. The more delivery connections you have open, the faster your messages will send to your mail server. For businesses with large email lists, time is money! 2. You can link to your external contact databases and Address Books with the Business Edition. No need to import your email lists into GroupMail. 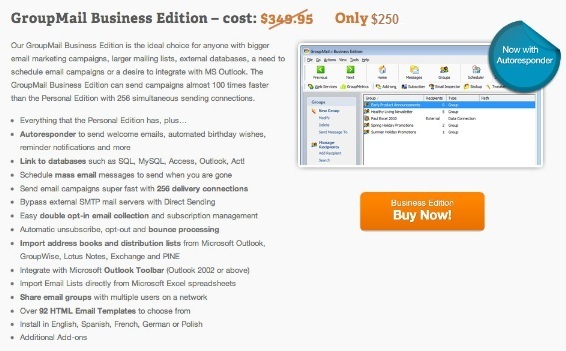 If you currently manage your email lists in Outlook, Access, Excel, MySQL, SQL Server, ACT! or other popular CRM databases, you can connect GroupMail to those databases rather than importing your contacts into GroupMail. 3. You can schedule messages for delivery at any time in the future with the Business Edition. 4. There are over 120 stylish HTML email templates to choose from in the GroupMail Business Edition template library. 5. You can install a GroupMail toolbar in your MS Outlook client and integrate with your Outlook Address Book. 6. The Business Edition includes an Autoresponder which allows senders to create and schedule a series of emails to be sent automatically, in sequence, to subscribers when they join a mailing list.